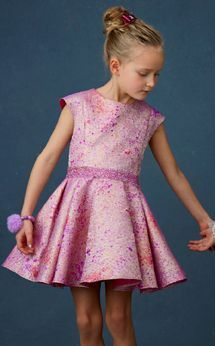 So sweet, so beautiful; your girl will be the life of every party in this Halabaloo Galaxy Pink Fit & Flare Party Dress. A stunning, pink galaxy inspired fit-n-flare skirt in lush brocade shimmers and shines, all complemented by a sparkly belt crafted from satin and rhinestones. The bodice features sweetheart neckline and short cap sleeves for an amazing, hand-crafted look.